"The Mursell spokeshaves are absolutely brilliant." That was what one of my students said about these two shaves at my Saturday classes. And I have to agree. These are tools designed by a working chairmaker for working woodworkers. I had a medium spokeshave and a fishtail spokeshave from James to test. They both have maple bodies and Hock blades. Setting the blades is accurately controlled by threaded rods with knurled knobs and set screws. The shaves are supplied with Allen keys for the set screws and it is these set screws that make all the difference. The blade projection can be adjusted with absolute precision. 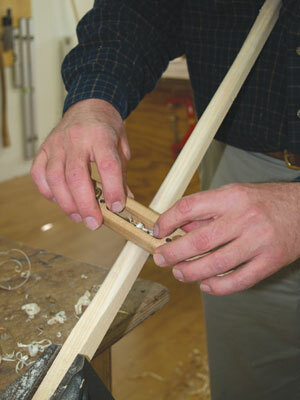 James uses the spokeshaves with just fingertips on either side of the body swell. There is a common misconception that the handles of spokeshaves should be gripped tightly in the fist by the user. This is wrong and the method that he teaches is to use just the fingertips, as he demonstrates. These tools can be used on end grain or long grain and I had a go with the smaller fishtail on some particularly wild elm that James was preparing for the seat of an exhibition chair. It was very sweet to use. Finally I should mention the small mouth and large throat. There can be a problem with some shaves clogging up when used fast on long grain. These don't. Brilliant. Should you have any problem using them, and I am sure you won't, you can actually telephone the designer and he will sort out your problem. 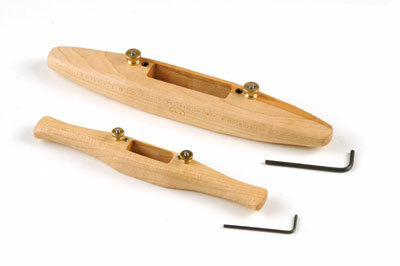 "These are tools designed by a working chairmaker for working woodworkers"